Few plants are as inviting to birds and butterflies as the canyon hackberry (Celtis reticulata). Formally in the Ulmaceae (elm family), recent genetic data places this genus into the Cannabaceae (hemp family). 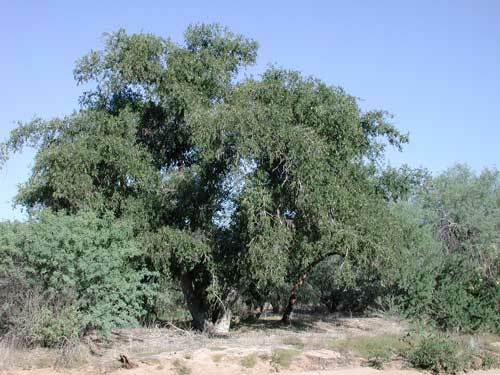 The canyon hackberry is a deciduous tree that develops a distinctive warty trunk with craggy branches above. The sandpapery leaves are food to several butterfly larvae including the American snout (Libytheana carinenta), the empress leila (Asterocampa leilia), the red bordered metalmark (Caria ino) and others. The flowers are nectar-rich and attract an array of nectar-feeding insects (bees, butterflies, etc). This is one of the traits that attract many species of insect-gleaning birds. The fruits that follow the flowers are attractive to another set of bird species. Fruits are also edible to people, but best made into a jam. Canyon hackberry is an easy tree to grow. Moderate to fast, it grows best in the lowest parts of the yard where water collects. Though it is a riparian native, it functions much like a mesquite, not needing as much water as a willow or cottonwood tree, but growing faster in moister areas. Full sun is best, but they can handle shade when young. When trees mature they become important nesting trees for many species of birds.